برش حرمک شامل تناوبی از کنگلومرای الیگومیکتیک اکثراً با آلوئولینیدها و نومولیتیدها، همچنین قلوه­های آهکی و کمتر قلوه­های آندزیت و بازالت و توف ریولیتی، ماسه­سنگ پبل­دار و شیل قرمز است. منشأ کنگلومرای سازند قرمز قاره­ای- آواری حرمک به احتمال زیاد از سازند دبیل و هم­ارز رسوبات پالئوسن پسین-ائوسن پیشین است. تقریباً 80 درصد از روزن­برهای سازند دبیل بسیار مشابه نمونه­های شناسایی شده در کنگلومرای برش حرمک هستند. در منطقه مورد مطالعه، بر اساس گونه­های شناسایی شده مانند A.canavarii,A.ellipticanuttalli, A.pasticillata,A.decipiens,A.fornasinii,A.globula,A.solida سن ائوسن پیشین پیشنهاد می­شود. Hormak Section consist of alternation of Oligomictic conglomerate with mainly Alveolinids and Nummulitid bearing calcareous pebbles and afew andesits, basalt and rhyolitic tuff pebbles, Pebbly Sandstone and red shale. The Sourse of red continental - clastic Hormak formation conglomerate probably was Debil formation and Equvaleut Late Paleocene – Early Eocene deposits. Approxmalty 80% of Debil formation foraminifer contents very resemble to that are identified in the Hormak Section conglomerate. In the studied area based on identified species such as A.canavarii, A.elliptica nuttalli, A.pasticillata, A.decipiens, A.fornasinii, A.globula, A.solida Early Eocene age are suggested. آقانباتی، س. ع.، 1370- گزارش نقشه زمین­شناسی چهارگوش نقشه زمین­شناسی دریاچه هامون، مقیاس 1:250000، سازمان زمین­شناسی و اکتشافات معدنی کشور. آقانباتی، س. ع.، ۱۳۸۳- زمین­شناسی ایران، ۶۴۰ ص، سازمان زمین­شناسی و اکتشافات معدنی کشور، چاپ سوم، 586 ص. بهروزی، آ.، 1372- شرح نقشه زمین­شناسی چهارگوش نقشه زمین­شناسی زاهدان، مقیاس 1:250000، سازمان زمین­شناسی و اکتشافات معدنی کشور. سامانی، ب. 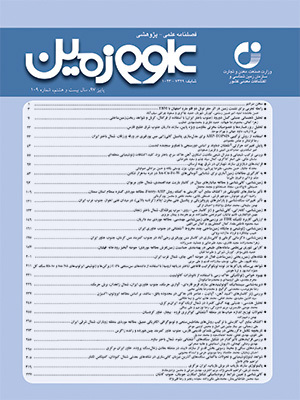 و اشتری، ش.، 1371- تکوین زمین‌شناسی ناحیه سیستان و بلوچستان، فصلنامه علوم زمین، سازمان زمین­شناسی و اکتشافات معدنی کشور، ش4، صص. 14 تا 25. مؤسسه جغرافیایی و گیتاشناسی ایران، ۱۳۸۹- اطلس راه­های ایران، مقیاس 2500000: 1. نوگل‎سادات، م. ع. ا.، 1372- نقشه زمین­ساخت ایران، سازمان زمین‌شناسی و اکتشافات معدنی کشور. Babazadeh, S. A. and De Wever, P., 2004- Early Cretaceous radiolarian assemblages form radiolarites in the Sistan Suture (eastern Iran). Geodiversitas, V. 26(2), pp. 185-206. Babazadeh,S. A., 2007- Cretaceous radiolarians form Birjandophiolitic range in Sahlabad Province, eastern Iran. Revuede Paleobiologie,V. 26(1), pp. 89-98. Berberian, M. and King, G., 1981- Towards a Paleogeography and tectonic evolution of Iran,Canadian Journal of Earth Sciences, V.18, pp. 210-265. Camp, V. E. and Griffis, R. J., 1982- Character,genesis and tectonic setting of igneous rocks in the Sistan Suture Zone,eastern Iran.Lithos, V. 15, pp. 221-239. Fotoohi Rad, G. R. , Droop, G. T. R. and Burgess, R., 2009- Early Cretaceous exhumation of high-pressure metamorphism rocks of the Sistan suture Zone, Eastren Iran. Geological Journal, V. 44, pp. 104-116. Fotoohi Rad, G. R., Droop, G. T. R., Amini, S. and Moazzen, M., 2005- Eclogistes and blueschists of the Sistan Suture Zone, eastern Iran: A Camparison of P-T histories form a subduction mélange.Lithos, V. 84, pp. 1-24. Geel, T., 2000- Recognition of stratigraphic sequence in carbonate platform and slope deposits. Empirical models based on microfacies analysis of Palaeogene deposits in southeastern Spain, Palaeogeography, Palaeocology, V. 22, pp 231-259. Mc Call, G. J. H., 1997- The geotectonic history of the Makran and adjacent areas of Southern Iran.Journal of Asian Earth Sciences , V. 15, pp. 517-531. Rahaghi, A., 1978- Paleogene biostratigraphy of some parts of Iran. National Iranian Oil Comраnу, Geolo-gical Laboratories, Teheran, publication, n° 7, 82 P, 41 pls. Rahaghi, A., 1980- Tertiary faunal assemblage of Qom-Kashan, Sabzewar and Jahrom area. National Iranian Oil Company, Geological Laboratories, Publication. V. 8, 94 P.
Stoklin, J., Eftekharnezhad, J. and Hushmandzadeh, A., 1972- CenteralLut reconnaissance East Iran.Geological Survey of Iran Report 22, 62 P.
Tirrul, L., Bell, I. R. , Griffis, R. J. and Camp, V. E., 1983- Sistan suture zone of eastern Iran.Geological Society of America Bulletin, V.94, pp. 134-150.